Samsung's rumored Galaxy S4 won't be released anytime soon, however a phone that sets itself apart produced by the company could come sooner rather than later. Sources speaking with DigiTimes report that the company is working on a Tizen-powered Galaxy phone, codenamed i9300. The model number falls in line with Samsung's habit of naming phones using letters and number and not actual words. Tizen is a Linux-based, open-source OS. Reports surfaced earlier this year that Samsung was planning to merge it with its Bada mobile OS and a possible prototype sporting its offspring surfaced in May. That prototype offered very little in the way of apps, revealing nothing more than a sparse UI. The handset did feature a 1.2GHz dual-core ARM processor with a 4.3-inch HD (1024x720) display. The handset appeared to just be a carrier for the OS, though it very well could have been an early working version of what the DigiTimes sources report. 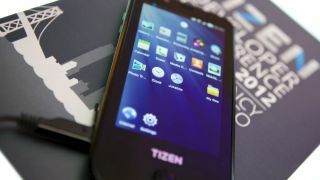 Tizen has the backing of several companies, including Samsung, Intel, SK Telecom, Orange, Sprint, and Vodafone. Despite big-time backing, Tizen, when it emerges, would enter a market flooded with competitors that have been around for a long, long time. Least among them is Google's Android and Apple's iOS, though Microsoft is joining the tussle with a tablet-compatible operating system launching next month, Windows 8. ZTE's Director of Mobile Device Operations, Wu Sa, revealed in July his company is open to a third-party OS outside of Windows Phone and Android. That system could very well be Tizen. Because it has Samsung's backing, which is quickly taking up pieces of the market previously held untouchable by Apple, Tizen could find standardization less of an uphill battle than DigiTimes sources anticipate. However, no matter how good it is, the OS may just be a small fish in a small pond dominated by bigger entities unscrupulous about gobbling up the competition.